Welcome to Measured Practice! Please take the time to watch over the videos below to help understand the basic functionality of the program. There will be more videos added to help understand the finer points of the program as we develop the program further. Players can see how easy it is to enter their on-course data and how to enter the data onto the printable scorecards while on the course. Players can see how enter and analysis the open practice sessions and their skill evaluations. Players can complete quick and extended game evaluations on course to analysis all aspects of their game. Players can see how they have ultimate control over filtering their data to their needs. Measured Practice™ improves your game by showing the player which shots are costing you the most strokes. This allows you to focus your efforts on the areas that will provide the most improvement. Measured Practice™ uses a strokes gained and lost method for on-course and practice sessions. The baseline is based off of a scratch player with and handicap of 0-2. This website is optimized for use with your smart phone, tablet, and PC. The average length of time to enter a round of golf into the program after the round is 5-7 minutes, making it one of the fastest data entry programs on the market. There are four sections to Measured Practice: Quick Skill Evaluation, Advanced Skill Evaluation and Open Practice, and On Course. Each section has a different purpose, but the only two questions players will be asked in each section are, “What is your current lie?” and “What is the distance to the hole”. The simplicity of data entry is one of the focuses we have for this program. The player will see the following abbreviations used throughout the program: "EL" = End Lie and “DTH" = Distance to Hole, these are where you will fill in the lies and distances to the hole. There are printable scorecards for all four sections if the player prefers to write in the information and record after and not on their phone while playing or practicing. Players should use range finders to record the distance off the green in yards. When the player is on the green they must walk off the distance in feet from the hole. The general assumption is that a stride is three feet. As long as you get within a couple feet the player will be able to obtain good data. Research shows that practicing in a manner that creates accountability and consequence is one of the most effective forms of practice. Incorporating Measured Practice™ into your practice will help you develop that accountability and allow you to take your skills from the practice area to the course. Additionally, successfully transferring your skills to on-course performance requires actual practice in the environment. This means that practice sessions have three key elements: they are completed on course, have accountability, and are randomized. These three key elements are what Measured Practice is all about. Adding Measured Practice to your training will help you understand where your technical skill bases or mental focus training should be concentrated. Currently the practice modules are very free and open to player's discretion. Players can choose the exact shots they would like to work on and hit those specific shots. This was by design to create some freedom for players that are practicing on-course and need to have flexibility with the distances and lies they are finding on the course while practicing. This is a new concept of measuring practice, so players will need to use their imagination to come up with shots that are similar to what they experience on the course. Players should complete their first five 18-hole rounds in the program to analyze the weak areas and then focus their technical work on these areas. The Performance Report will illustrate the areas of focus or the player can complete one of the comprehensive Skill Evaluations to help assess the player's areas of focus. The Skill Evaluations can be a more accurate assessment of skills and a more accurate way to prepare for your next event. Recreating the exact shots you will need in your upcoming tournament on your home course to prepare will be one of the best ways to use the Daily Practice section. After some of the technical work is completed then the player should be practicing in the environment of the golf course using Measured Practice to create accountability to their results. It's very important to know where you are at on the Game Traction Process (GTP) so that you can clearly make some decisions based on where your practice session should lead the player. Knowing where you are at in the process will guide you in the direction for the day and help you stay focused on the task. Goals and practice level are two things that rarely match up for all levels of players. Players that have expectations of their game that their practice levels will not support will constantly be let down by their performance. "More practice is not always better, informed specific practice is better"
Buying into the fact that you can only perform at a level that your weakest areas will allow for is key to gaining traction in your overall performance. Assessing that weakest area does require a little time and effort, but the payoff can be measureable. Committing to measuring specifics on your game is required to understand your game at a deeper level and maximize your time and efforts. How does Measured Practice™ fall into the GPT Process? Measured Practice™ is a program that will allow you evaluate your overall skill level, assist in the skill development and transfer piece, and track your competitive and noncompetitive rounds for analysis. 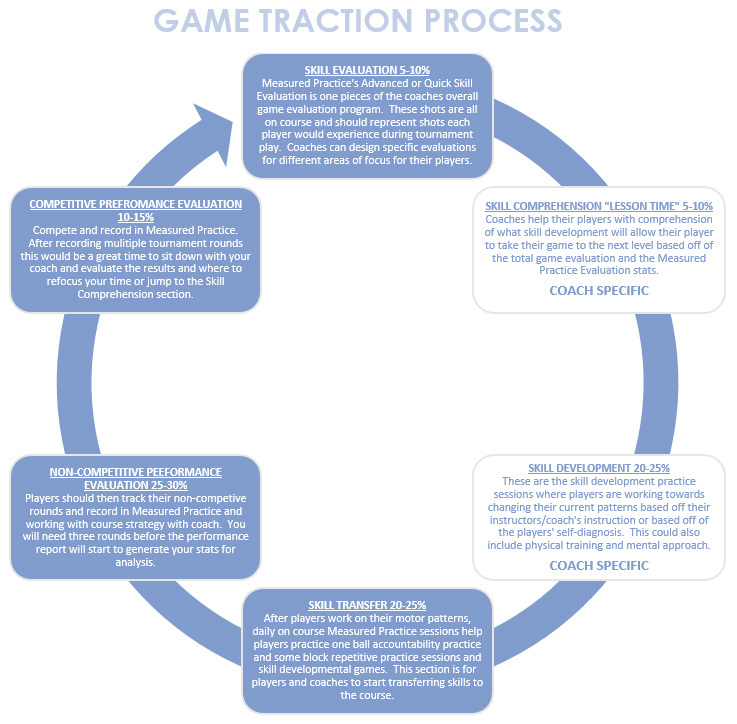 Players that buy into the process and the GPT Process will need to subscribe to the Measured Practice program online. This is a program to enhance the efficiency between coach/instructor and player to maximize the results and add efficacy to the developmental process. Daniel Gray has been in the golf industry since 2001 and most recently the teaching professional at Skokie Country Club in Glencoe, Illinois. Daniel has focused predominantly on competitive junior players and has observed and worked with some of the best teaching professionals and coaches in the country. Measured Practice was developed out of necessity to understand player's weaknesses on a deeper level and help the players gain traction in their game. The strokes gained method is an extremely accurate and simple way for players to view the quality of the different areas of their game. After developing countless spreadsheets and helping players keep their stats in this method, he developed the idea of using this in a practice environment to help players stay focused during practice sessions and also to help the player understand the performance of their practice sessions day to day.